Although decontamination of a chemical from the skin is commonly performed by washing with soap and water (because it is largely assumed that washing will remove the chemical), recent evidence suggests that the skin and the body are often unknowingly subjected to enhanced penetration and systemic absorption/toxicity because the decontamination procedure does not work or may actually enhance absorption . 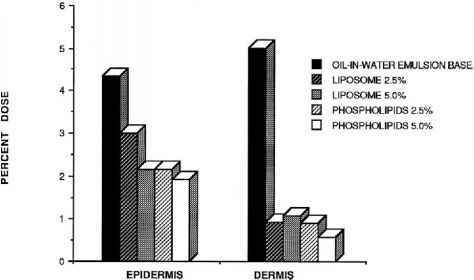 Figure 6 Distribution of lidocaine in human epidermis and dermis. Formulation determines the concentration within the skin component. 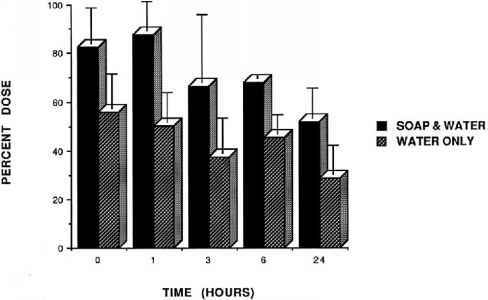 Figure 7 Hydrocortisone in cream base was dosed on human skin as a low dose (x) and a high dose (3x). 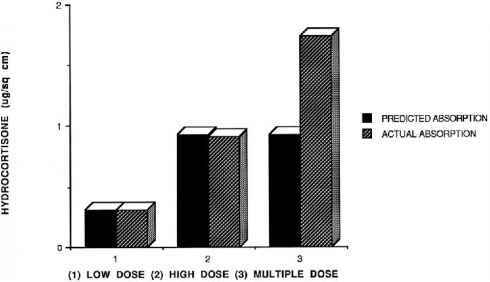 When the low dose (x) was dosed three consecutive times (9 a.m., 1 p.m., 9 p.m.) totaling the high dose (3x), the absorption exceeded that predicted from the single high dose. Figure 8 Skin decontamination of alachlor (lipophilic chemical) requires some soap to exceed removal by water only. Figure 8 (alachlor) shows skin decontamination with soap and water or water only over a 24-hour dosing period, using the grid methodology. A series of 1 cm2 areas are marked on the skin and each individual area is washed at a different time. Certain observations are made. First, the amount recovered decreased over time. This is because this is an in vivo system and percutaneous absorption is taking place, decreasing the amount of chemical on the skin surface. There also may be some loss attributable to skin desquamation. The second observation is that alachlor is more readily removed with soap-and-water wash than with water only. Alachlor is lipid soluble and needs the surfactant system for more successful decontamination . Soap-and-water wash may not be the best method to cleanse skin. Soap and water will remove visible dirt and odor, but may not be a good skin cleanser. Figure 9 shows methylene bisphenyl isocyanate (MDI) (an industrial chemical) decontamination with water, soap and water, and some polyglycol and oil-based cleansers. Water and soap and water didn't work well but the polyglycol and oil-based cleansers did the job. The unknown question that remains is whether soap and water would then remove the polyglycol and oil-based cleansers .